When I'm working on the torch everything else begins to melt away. For a few hours my stress leaves my shoulders. The running list in my mind of things I should have done or need to do stops playing, and all the chatter in my head goes quite as my focus narrows to the sweet spot in the flame. After a while I find a rhythm as I repeat the same motions over and over. This stillness in motion becomes a kind of meditation. For me it is a way to pray and praise. I'm grateful to Sam at Dream Fire Glass for introducing me to this skill set. 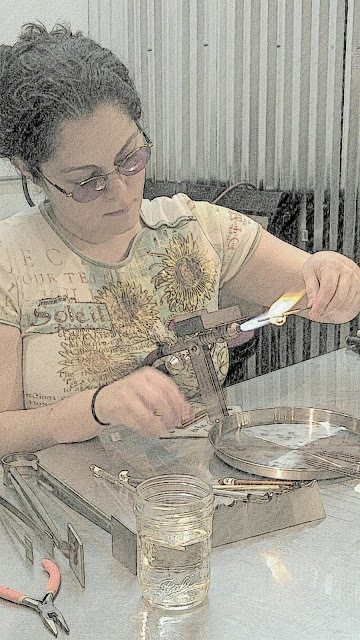 Working with glass in the flame has increased my understanding of this material and in some ways of myself. Thank you Sam.